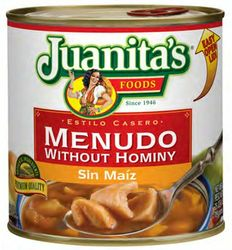 A tribute to Southern Mexico, with all the delicious taste and quality of Juanitas Menudito Menudo but without hominy. Warm it up, add oregano, chopped onions, crushed pepper or Menudo mix, cilantro and some drops of lime to taste. Serve with warm tortillas. Now Authentic Mexican cuisine is easy to prepare. Juanitas Foods offers traditional dishes, manufactured with the highest quality ingredients. Enjoy the delicious variety of products from Juanitas Foods with your family. From Juanitas kitchen to yours. It is Juanitas; It is Authentic! Savor the Flavor of Mexico! Beef tripe, water, chile pepper, salt, flavorin (Dextrose, Salt, Natural Flavors, Spices, Sugar, Partially Hydrogenated Soybean/Cottonseed oil and Hydrolyzed Corn Gluten, and Tri-Calcium Phosphate(as ant caking agent)), Beef Broth, Garlic Powder, and Gelatin. Menudo sin Maiz de JuanitasUn Homenaje al Sur de Mexico, con todo el delicioso sabor y calidad del Menudito Juanitas, pero sin granos de maiz. Calientelo, agreguele oregano, cebollita, chilito molido, cilantro picado y unas gotitas de limon al gusto. Sirva con tortillas calientitas. Ahora, la comida autenticamente Mexicana es facil de preparar. Juanitas Foods le ofrece platillos tradicionales, elaborados con los ingredientes de mayor calidad. Disfrute con su familia la sabrosa variedad de productos de Juanitas Foods. De la cocina de Juanitas a la suya. Es de Juanitas; Es Autentico! Disfrute el Sabor de Mexico! Pancita de Res, Agua, Chile, Sal, Flavorin (Dextrosa, Sal, Saborizantes Naturales, Especias, Azucar, Aceite de Soya/Algodon Parcialmente Hidrogenado, Gluten de Maiz Hidrolizado, Fosfato de Tricalcio (Como Anti-Apelmazante)), Caldo de Res, Ajo en Polvo y Gelatina. I ordered this because I eat keto, which means lots of fats and protein and practically 0 carbs and I love menudo! This way I can only enough hominy to keep my carbs under 20 per day. This has less than 2 carbs per serving while offering 16 gram of protein! So perfect for my way of eating! I don't like hominy that much so I prepare it with potatoes and noodles. I like it much better that way. 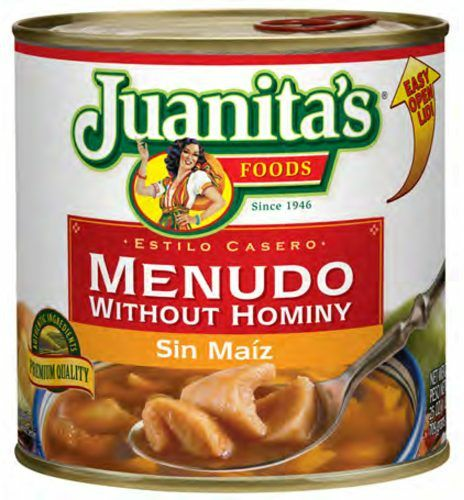 I have always loved this product with hominy but since trying to stick to a low carb diet I am so grateful that this company offers this same excellent menudo without the hominy. It is just as good and just as satisfying. My go to for a quick snack, or a whole meal with no guilt and if ever I am sick with a cold I'm almost happy for the excuse to induldge relentlessly in my favorite Menudo. If you like Menudo you have to try this, it is excellent and beats making it yourself. ProsThe ease, the taste, the quality, and that it comes in the larger cans. ConsThe only thing I dislike is that my local grocery store does not stock it. I love this Menudo!!!!!!!! It is so hard to find the Menudo without hominy! I wish I could get it from my grocery store (Jewel), because shipping costs a ton, but I love it!!!!!!! !